What a week (almost a month ago)! Yes. That. Me. Busy. But not in the “we live in a busy world and being busy is a badge of honor” kind of way. Just in a working-full-time-two-kids-dog-three-cats-household-and-trying-to-enjoy-life-too kind of way. 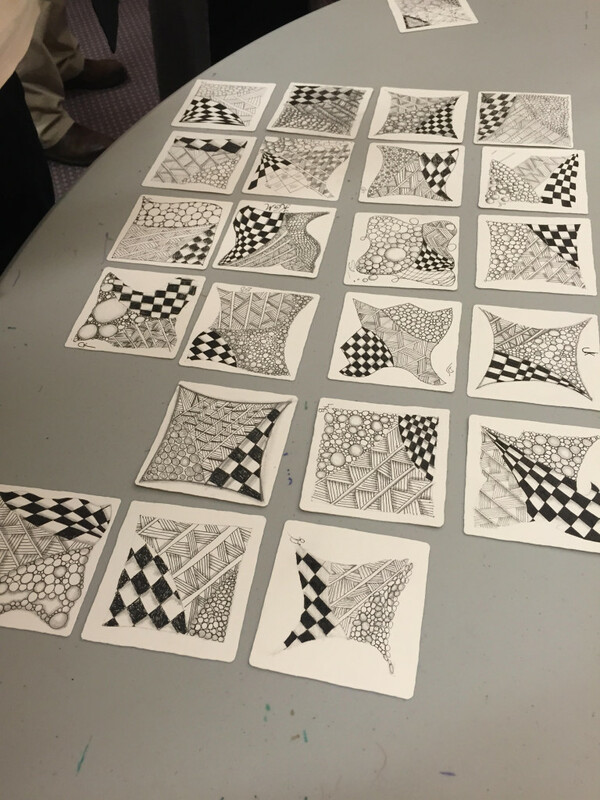 Last night Almost a month ago I taught my first sizable Zentangle class. Courtesy of a grant that the Lansdale Public Library procured for programs that help people with stress relief, I was asked to teach one class a month which is offered to the community free of charge. (More info here.) There were 26 people in the class and I have to say, I was relaxed, comfortable and found it very natural. Having once been an elementary school teacher, I am no stranger to standing in front of a class of that size, but they were smaller. The feedback was good, but I’m curious to see what the evaluations say. One epiphany: Everyone was paying attention, relaxing, breathing…but the “OOOOOOOH” moment happened when the first mosaic of tiles came together. Everyone loved seeing how every tile was different and how they were all beautiful in their own ways. Here are the two mosaics from the class. I have to admit, it’s a heady feeling to see these come together and see the students oooh and aaah over them. As for this week’s I Am the Diva Challenge…since I wrote this originally WEEKS ago…I didn’t participate. And then I went on vacation. And then…it’s another week later. I’m doing it this week! And teaching another class on Wednesday! 2 Responses to What a week (almost a month ago)! Wow! Looks like a great class. The mosaics are magical. You did a great job teaching.